Post Office #12 | Historic Jacksonville, Inc. When Jacksonville Postmaster Lynn Houston Valentine resigned in 1963, the Post Office Department proposed to make the Jacksonville post office a substation of Medford, citing the potential for improved service for less money. 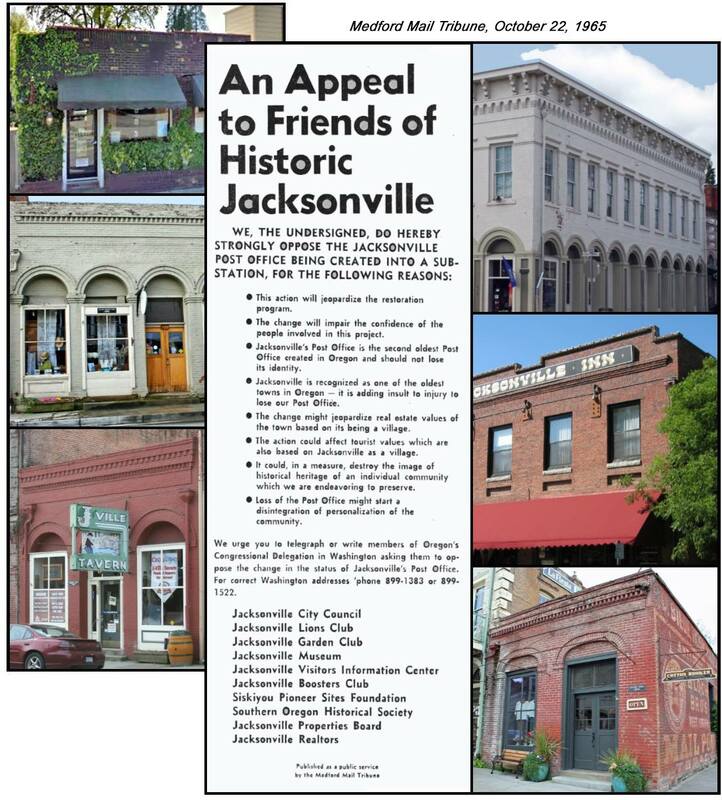 Considering that the Jacksonville post office was the oldest continuously operating post office in the county, residents, businesses, and organizations actively opposed the proposal, saying they were perfectly happy with current service. Opponents published an “ad” in the October 22, 1965, Medford Mail Tribune as “An Appeal to Friends of Historic Jacksonville.” Signed by the City Council, the Lions Club, the Garden Club, the Jacksonville Museum, the Visitors Information Center, the Boosters Club, the Properties Board, the Realtors, the Siskiyou Pioneer Sites Foundation, and the Southern Oregon Historical Society, it cited the town’s uniqueness, its efforts to preserve historic heritage, and the post office’s role as a focal point for residents, the potential for a change to jeopardize the town’s restoration program, the impact on real estate values, and the impact on tourism. The proposal’s opponents ultimately prevailed, and the Jacksonville Post Office remains the oldest continually operating independent post office in Jackson County, Oregon!